Its a New Year which means its time to get back to work around the house. Normally we start off the year with a massive project , like building a new bed or painting the common rooms in our house, but this year I am starting really small. I'm starting small because there are a few areas around here that are preventing me from updating our home tour. Which is totally annoying! 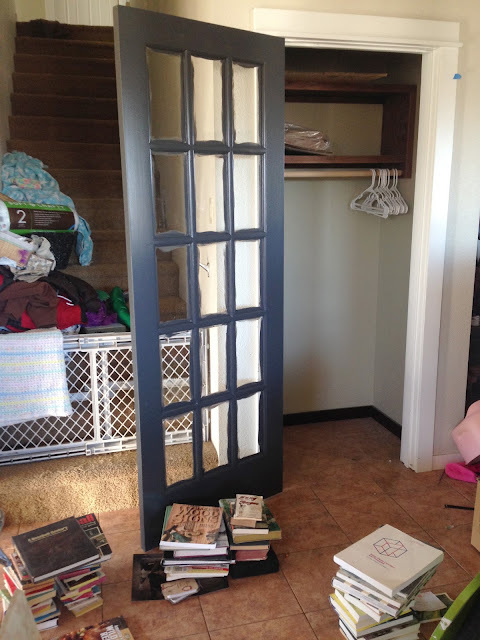 Plus, I promised a more realistic view of what is ACTUALLY happening around here...not just DIYs and big reveals. 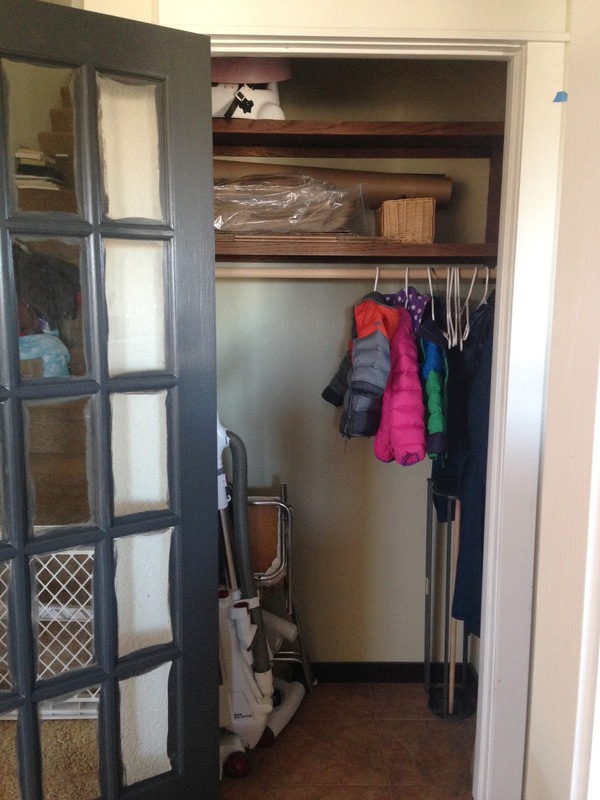 So today during the kids naps (and in lieu of eating another PB & Honey sandwich...darn pregnancy cravings) I decided to tackle our front entry coat closet. Besides the obvious clutter and crap, you can also see that I haven't cleaned up the glass from where I painted the door last fall. Super cute. So I pulled everything out and began sorting into piles. & has another home home pile. VERY sophisticated sorting process, I must say. 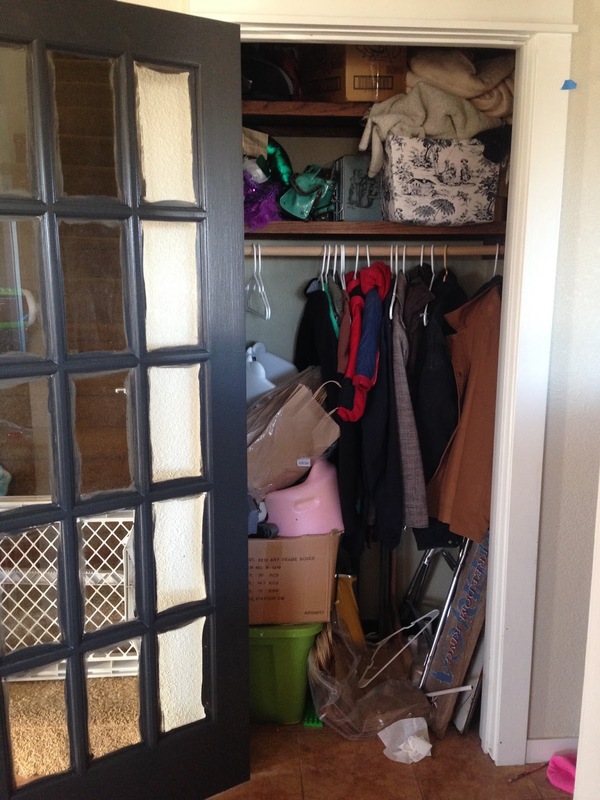 Finally, I only put the stuff that needed to stay in the closet back in. All my packing and shipping materials, the coats we wear daily, my vacuum and a few baby supplies that I need to keep until the next baby outgrows them. I am still finding homes for all the other crap (which may get purged again before I do), but I am super happy that the closet can breathe again! Bonus...it only cost me a little energy! Next up, scraping off all the paint and figuring out a way to frost the glass. I'm thinking contact paper, but I'm not sure. Any suggestions?